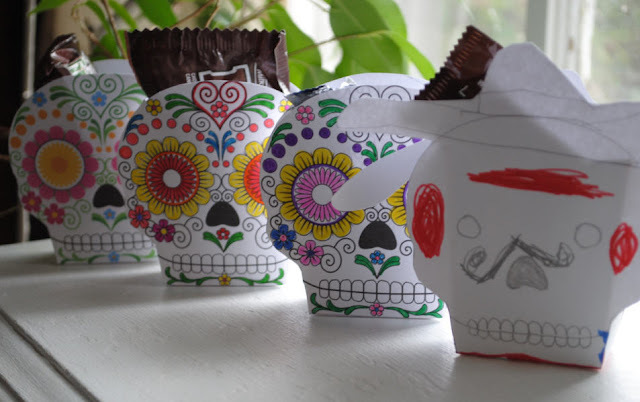 How cute are these Día de los Muertos treat boxes from Don't Eat the Paste? You can print up the color-it-in version, or one that is already vibrantly decorated. My daughter and I enjoyed coloring ours in, but my son preferred a blank face all together so that he could decorate it his own way (hence the cowboy hat). All you have to do is print them up on cardstock, color them in (optional), cut them out, and glue them together. I think these are perfect for holding candy, crayons, or other small treats. I was also tickled to find that HP has free Day of the Dead printables available on their Creative Studio site. 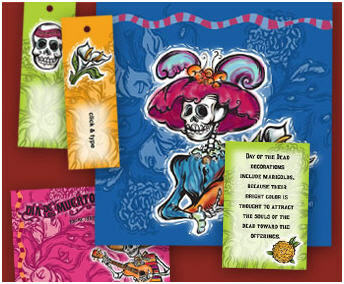 The Day of the Dead Party Kit includes invitations, decorative cards, fiesta facts, glass charms, decorations, and wall hangings. Sadly, HP has removed this Party Kit. What a shame!